In this situation, the fact that the taxa under consideration share the trait state may hint strongly that they are closely related. But the fact that the trait state is plesiomorphic means the hint may be entirely misleading. It must be disregarded. The question whether those taxa are closely related must be determined from other evidence. The term symplesiomorphy was first introduced in 1950 by German entomologist Willi Hennig. Reversal – is the loss of a derived trait state, reestablishing the plesiomorphic trait state present in an ancestor. Pseudoplesiomorphy – is a trait that cannot be identified as a plesiomorphy nor as an apomorphy. 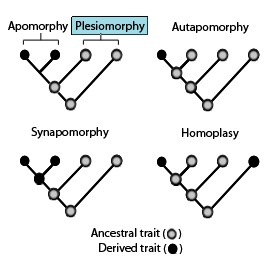 The concept of plesiomorphy addresses the perils of grouping species together purely on the basis of morphologic or genetic similarity without distinguishing ancestral from derived character states. Since a plesiomorphic character inherited from a common ancestor can appear anywhere in a phylogenetic tree, its presence cannot reveal anything about the relationships within that tree. A famous example is the trait of breathing via gills in bony fish and cartilaginous fish. Bony fish are more closely related to terrestrial vertebrates, which evolved out of a clade of bony fishes that breathe through their skin or lungs, than they are to sharks, rays, and other cartilaginous fish. Their kind of gill respiration is shared by the "fishes" because it was present in their common ancestor and lost in the other living vertebrates. The shared trait cannot treated as evidence that bony fish are more closely related to sharks and rays than they are to terrestrial vertebrates. ^ Roderick D.M. Page; Edward C. Holmes (14 July 2009). Molecular Evolution: A Phylogenetic Approach. John Wiley & Sons. ISBN 978-1-4443-1336-9. ^ Patterson, Colin (1982), "Morphological characters and homology", in Joysey, Kenneth A; Friday, A. E., Problems in Phylogenetic Reconstruction, Systematics Association Special Volume 21, London: Academic Press, ISBN 0-12-391250-4 . This page was last edited on 22 October 2018, at 06:00 (UTC).